This is a perfect quick gift for the crossword obsessed amongst your friends and family - or yourself! 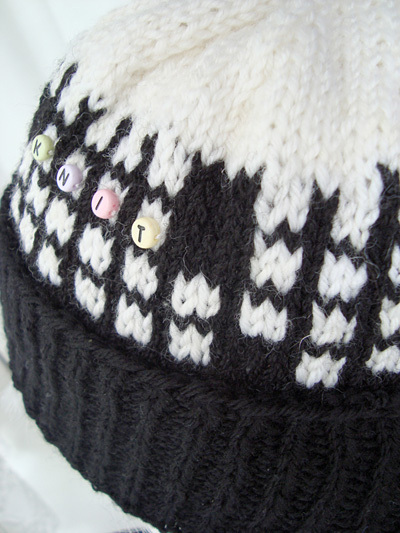 You can leave the beanie unadorned, or add some apt words using letter beads. 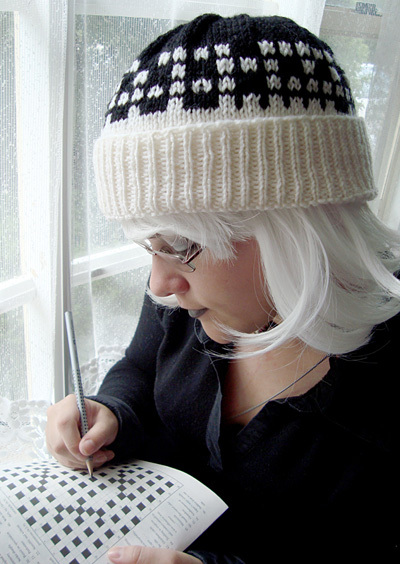 This crossword beanie is an easy introduction to fair isle knitting. The stranded section is only 8 rows in all. The second row in each line of crossword squares is a copy of the previous one, so you only have to count stitches in 4 rows. The regular grid design also makes it easy to follow, and there are only two colors. As a puzzle writer, I spend my days surrounded by words, letters, crossword grids, and other patterns. Adding them into my knitting seemed the logical next step (or possibly a sign of madness!). Note: If knitting this hat for someone with a small head circumference, using a smaller needle size for the brim will give a snugger fit. As written, this hat has a white brim and black crown. It can also be worked with a black brim and white crown. 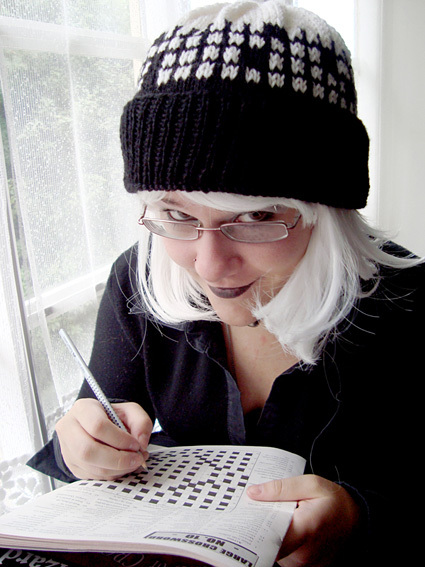 In these photos, the American-style crossword grid is shown on the beanie with the black brim, and the British-style crossword grid is shown on the beanie with the white brim. The Long-Tail cast on method is recommended for this project. 1) American-style crosswords have few black squares, and nearly every letter in the grid appears in two words (ie Across and Down entries). This pattern is a bit easier to knit, as it has fewer black squares. 2) British-style crosswords (which are found in all Commonwealth countries) have many more black squares, and roughly half the letters appear in only one word. This is a little more challenging to knit because there are more black squares. Using long-tail method and MC, CO 108 sts onto circular needle. Work 19 rounds in 1x1 Rib. Work Rounds 1-11 of preferred crossword chart. Break MC, leaving a tail. Using CC, k 5 rounds. [K7, k2tog] to end. 96 sts. [K6, k2tog] to end. 84 sts. [K5, k2tog] to end. 72 sts. [K4, k2tog] to end. 60 sts. [K3, k2tog] to end. 48 sts. [K2, k2tog] to end. 36 sts. [K1, k2tog] to end. 24 sts. Round 13: [K2tog] to end. 12 sts. Round 14: [K2tog] to end. 6 sts. Break yarn, leaving a tail. Draw tail through remaining sts and pull tight. Weave in end securely. Use yarn tail from CO to sew closed the small gap in CO edge. If desired, form words in crossword squares by sewing letter beads to hat using sewing needle and thread. Alternately, words may be embroidered using embroidery thread. Use an online puzzle resource such as OneLook if you want to figure out interlocking words to fill in some or all of your crossword grid. 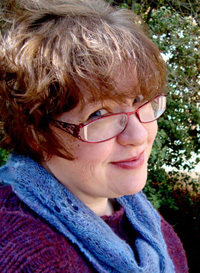 Denise (Jejune1 on Ravelry) is a syndicated puzzle author, artist, and knitter. She is the co-author of Cracking Codes and Cryptograms for Dummies, and her puzzle book Word Searches for Dummies (Wiley 2009) includes several knitting-themed puzzles, bringing the madness full circle! She lives in Canberra, Australia with her astrophysicist husband, their two grown-up kids, four rats and one chihuahua. Denise blogs here, and has free knitting patterns, (including more crossword-themed patterns) and puzzles on her web site.